Every fall, our club holds a tournament open to traditional karate practitioners - adults above the age of 18, and youths 6 to 17. Our goal is to provide everyone with a fun, safe and exciting opportunity to enhance our karate training. 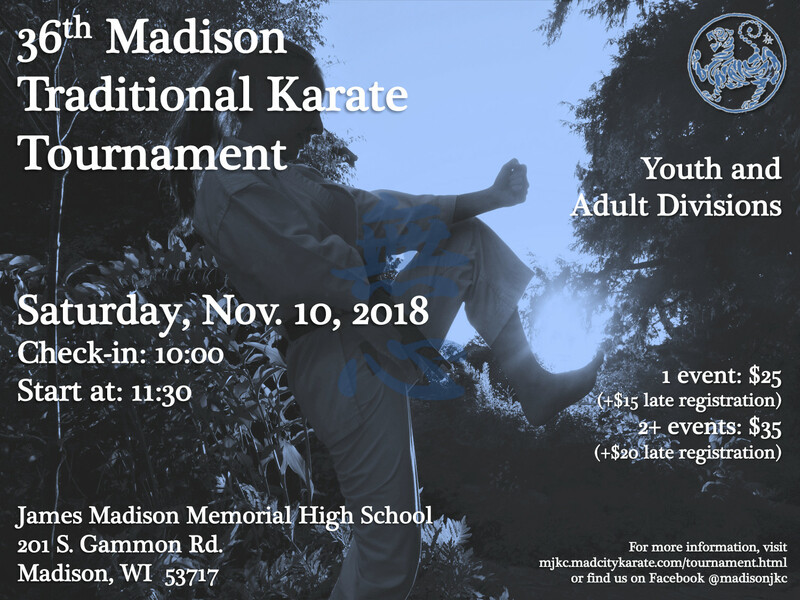 The 36th Annual Tournament will take place on Saturday, November 10, 2018, at the James Madison Memorial High School gymnasium, 201 South Gammon Road, Madison, WI 53717. Check-in starts at 10:00, and the tournament is scheduled to start at 11:30 am. The school has a large parking lot with a lot of space, and it is only a mile away from the tournament hotel. We have a block of rooms at the AmericInn by Wyndham Madison West hotel for $75.00 a night plus taxes. Only 15 rooms are available at that rate. To reserve your room, please call the hotel at +1-608-535-4712 and ask for the “Mad City Karate Room Block”. This rate is only available until November 1st. The hotel offers free parking, free breakfast, free WiFi, has an indoor pool, and a fitness center. It is close to several nice restaurants, and to West Towne Mall. If you missed the deadline of November 1st, or if you you would like to check out other possibilities, there are other special rates for this event at Hotels.com. The registration form for the tournament is available online, and you can install an app on your phone or tablet to register. The registration form is also available in PDF format. Online registration will be available without late registration fees until 10 pm Central Time on Thursday, November 8th. If you choose online registration, you will have to bring the signed registration form (which will be e-mailed to you) and your payment when you check in. If you use the PDF form, please fill it out, print it, and mail it by Monday, November 5th to avoid late registration fees. The registration fee is $25 for one event, and $35 for 2 or more events. The cost for late registration is $40 for one event, and $55 for two or more events. Check in for competitors will start at 10:00 am, the referee and judges session will start at 10:30 am (competitors are welcome to participate), and the tournament will start at 11:30. Beginners (7th kyu and 8th kyu) may chose either One Time Attack or semi-free style sparring. Participants in the Intermediate category (6th to 4th kyu) will compete in semi-free style sparring. Brown belts and above may chose among Ko-Go kumite, Jiyu Kumite (free sparring), or both. Black belts (14 and older): may chose among Ko-Go kumite, Jiyu Kumite (free sparring), or both. The one time attack event is an alternating attack and response, starting from a fixed initial position. Please review the one time attack rules, and feel free to ask us any questions. The semi-free sparring event is an alternating attack and response, starting from a dynamic fighting position. Please review the semi-free sparring rules, and feel free to ask us any questions. The goal of Ko-Go kumite is to develop the use of combinations in sparring for both the attacked and the defender. The Ko-Go kumite rules are based on the WTKF rules. The En-bu event is a two person pre-arranged encounter where an attacker and a defender demonstrate the use of karate techniques for self defense. The encounter should last for about one minute (40 seconds for 4th kyu and below), and participants are judged on the same principles as kata. This year, there is a single division for same gender or mixed gender partners. Based on participation, the division may be split by age, or rank. The Fukugo event is a single elimination event where the final round is free sparring (Jiyu Kumite or Kogo Kumite for youths), and each preceding round alternates between performance of the Kitei compulsory form, and free sparring. This event is for brown and black belts only. All online registrations must be submitted by 10:00 pm Central time. Late fees will be added to any online registrations after that.